Below is a list of maps I've created using Campaign Cartographer 2.0. Each map includes a link to view a gif version of the map, and another link to download the CC2 version of the map. The CC2 maps are compressed using WinZip 7.0. Although some of the buildings and dungeons that I've drawn have more than one level, I've only included one level as a gif sample in order to save space. The CC2 downloads, though, contain all the available maps for that building or dungeon. Those who do not own CC2 can download a free viewer from the ProFantasy website. It will allow you to view and print the .fcw files. You can't edit the maps with it, but it is far superior to working with just the .gifs. If you're not familiar with CC2 or CAD based programs, one of the features is that when you zoom in on part of a CC2 map you don't get the pixelated effect like with a gif or jpg picture. You get all the small details of the map enlarged with the same clarity as the normal view. Try the viewer and be amazed. 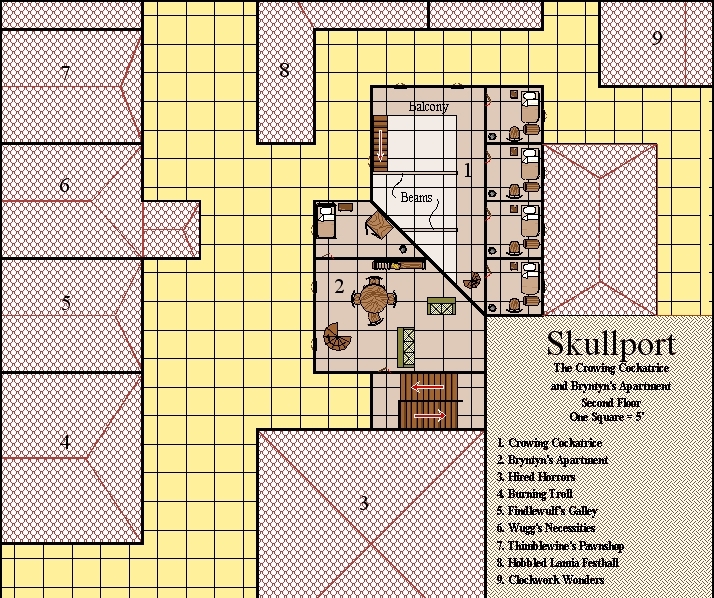 January 13, 2009 - The maps of Skullport have been updated to correct some errors, and to improve their look. I have also added a new page to provide details about the two businesses shown on the maps and the NPCs who run them. Enjoy! Skullport: Bryntyn's Brews and the Crowing Cockatrice -- New and Improved!! The Shrine of Yeenoghu - Defeat the gnoll cleric and rescue the sorceror! This is a small, 3e adventure I wrote for a couple of my nephews. It's a short dungeon crawl designed for first level characters, and can be placed anywhere in the Realms. I used the dungeon generator at Jamis Buck's RPGenerators to create the dungeon map, then reworked it in CC2. I also used the downloadable NPC generator to help me generate stats for the NPCs. Download the CC2 map with adventure text. Under Illefarn (Four Maps) - I've finished my project to map out the dwarven stronghold from N5 Under Illefarn. The maps in the module are given in about 16 sections, but they only extend over four layers. How do they all join together? Not very well, actually, and I've had to alter them slightly to make stairways and ramps line up. All the sections are shown on the proper layer, and I've done my best to place them in what should be their relative positions. Undermountain Expansion - Below are maps and notes for an adventure in Undermountain that I ran in my Waterdeep Campaign. I have updated the Undermountain map to show the new locations. The adventure is not completely fleshed out. I've included just the notes that I worked from when I ran it. In the gif, I've shown only the section of Undermountain where the expansion was added, so it would show up in greater detail. Download the CC2 map and adventure notes. House on Slop St - This is the floorplan of a two-story house that I located in the Adventurer's Quarters as a rental house for a group of PCs. It is fairly generic and could be used pretty much anywhere. 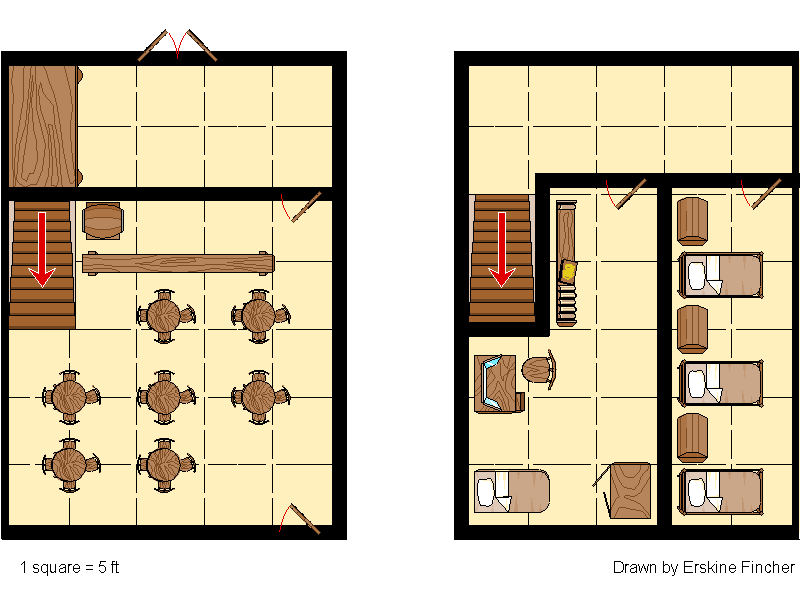 Red Gauntlet Tavern - A floorplan for the Red Gauntlet Tavern in Waterdeep. Could be used as a small, generic tavern. Red Sails Warehouse - A warehouse owned by the merchant, and secret member of the cult of Loviatar, Hlethvagi. Could be used as a generic warehouse. 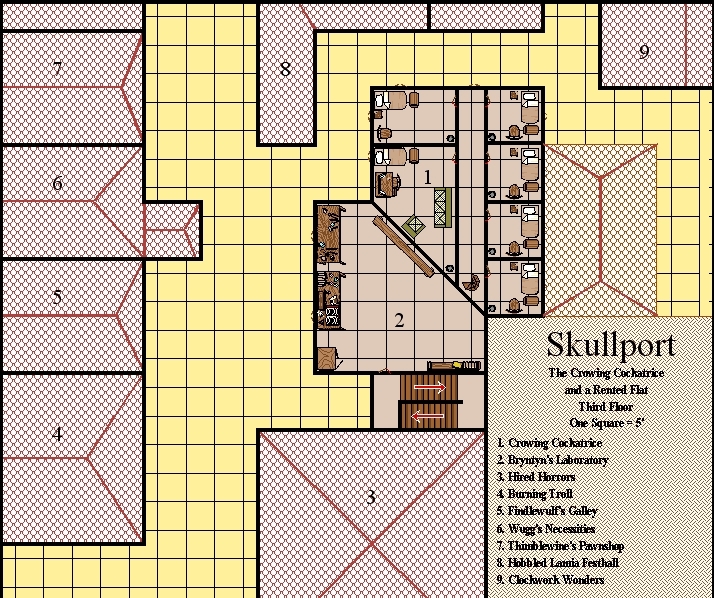 Skullport: The Crowing Cockatrice and Bryntyn's Brews (Three Maps) - This was my attempt to detail the Crowing Cockatrice inn in Skullport. Bryntyn's Brews is an alchemist shop specializing in poisons that I added myself. This was done before publication of the recent book on Skullport by Joeseph C. Wolf, and it differs somewhat from his description of the inn. For one, my version has three floors instead of two, and it appears that the area I'm using for Bryntyn's Brews was intended to be part of the inn. The beauty of the CC2 maps is that they are easily modified, so DMs wanting to stay with the official description can take out Bryntyn's Brews and use just the first two floors. Go here to see my detailed write up of the two businesses. The Yawning Portal (Two Maps) - The gif shows the first floor of the Yawning Portal. 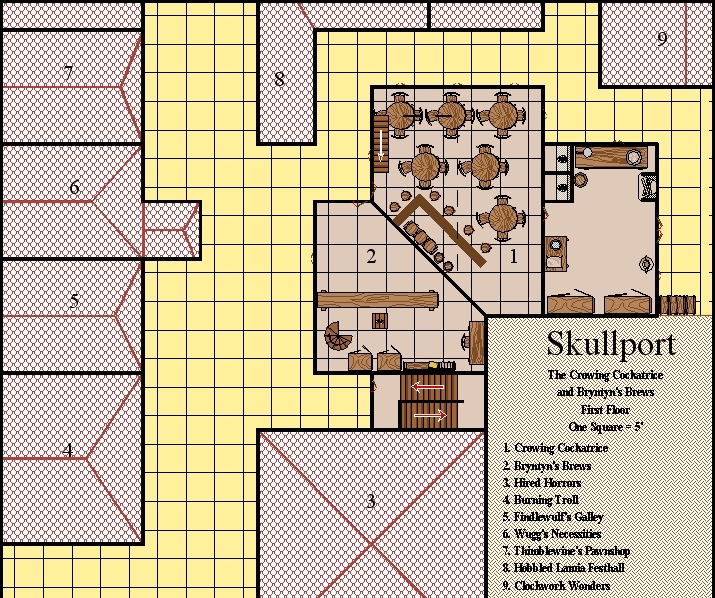 This was adapted from a floor plan in the City System box set, but improves on that map by actually showing the dry well that gives the inn its name. I had to increase the width of the building in order to fit the 40' diameter hole in the common room. In order to take up the extra width, I made some alterations to the second floor as well. Arylon - This map is incomplete. I started drawing it for the Arylon Project, but resigned from the project before it was done. I turned the map over to them to finish, and I'm not sure if it was ever completed. The zip file contains a map key. There used to be a site where one could get details of the locations, but it has disappeared. I am working on putting the information up on my site, but there's still a lot to do. Longsaddle - I created my own version of Longsaddle for a 3E campaign I was running in the North. It has fewer and less powerful members of the Harpell family. (Never liked those guys.) I've changed quite a bit of the town, and the map is totally different. If you're looking for an alternative to the canon Longsaddle, you might like it. Click on the Longsaddle button in the menu to the upper left, or go here to see the write up. 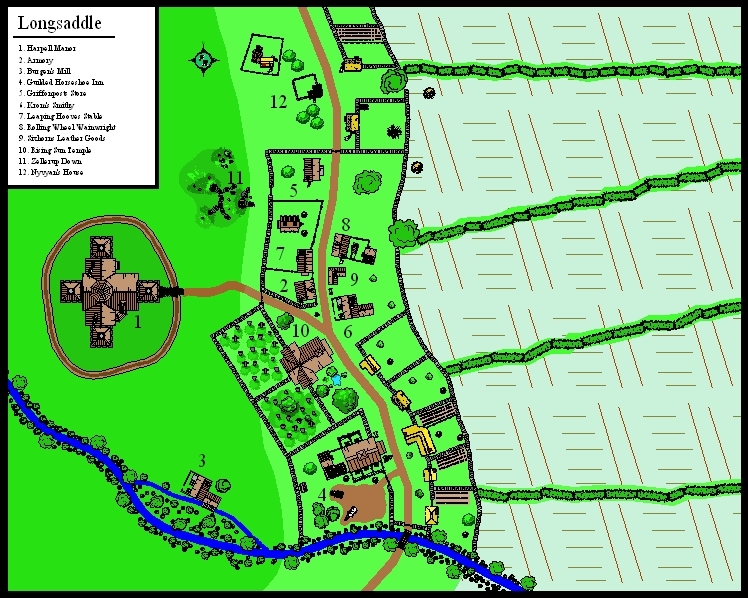 Waymoot - This map shows the Waymoot in Waterdeep where the High Road and the Way of the Dragon meet. The Red Gauntlet Tavern is located in this area. It was drawn in the style of the city block detail maps in the FR-Atlas. Arylon Regional Map - Also created for the Arylon Project, this map shows the outlying areas around Arylon, as well as the areas patroled by the local governments. The towers are the outposts of Elturel's Hell Riders. The Fields of the Dead - A wider view of the area around Arylon that shows the entire Chionthar River Valley and the Fields of the Dead. This map was created to show people where exactly Arylon is located in the Sword Coast region. The Longsaddle Region - A map showing the area around Longsaddle. Waterdeep Region - This map is based on one that appeared in Dragon #128 for the article "Welcome to Waterdeep." It shows important features of the land around Waterdeep, an area that is for the most part controlled by the Lords of Waterdeep. 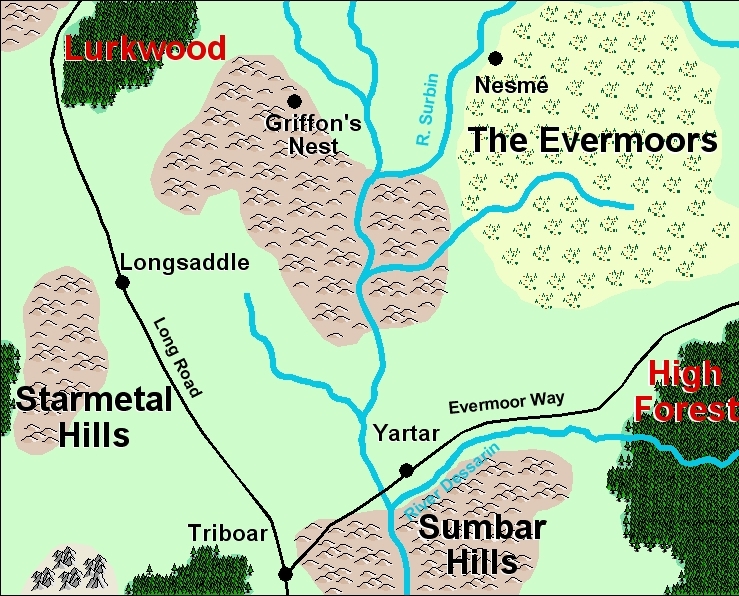 I have added the locations of some places in Ardeep Forest that were highlighted in another recent Dragon article by Ed Greenwood in his Volo's Guide series. The Eastern Realms of Vel - Vel is my own game world that I created with a combination of larceny and imagination. The perceptive (and well-read) will notice a few place names are taken from some of the beginner box sets published by TSR. The map itself is mine, and it shows the subliminal influence of living all my life in Florida. A completely unintentional resemblance, but there it is nonetheless. Being a continental map, it's rather large and kind of busy. One of the problems with mapping large areas is you have to choose between making the text readable when the map is expanded to full extents, or keeping the text from blotting out everything else on the map. Dragon Mountain - A very small section of Dragon Mountain as mapped by Dain Firebeard, a dwarven character I played in the Dragon Mountain campaign.